In all the fervor over new plants, we often forget old standbys such as Polemonium (Jacob’s Ladder). This ferny-looking perennial supposedly thrives in full sun or partial shade as long as it receives sufficient moisture and has well-drained soil. For years, however, I tried growing it in partial shade but never really succeeded with it until I put it full sun. it is possible that it rots in partial shade because it is too moist. Although rich soil is preferred, it should also be well-drained. There are several different species but the one most suited to Ohio is Polemonium reptans, native to eastern North American woodlands and Midwest plains. Happily, it seems to be impervious to deer browse unlike other woodland wildflowers such as Trillium. It is also rabbit resistant. Although sometimes called Creeping Jacob’s Ladder, it is a clumper but reseeds. The weak stems never exceed twelve inches while the flower stalks can reach eighteen inches. The light blue flowers appear in late April in loose, drooping clusters and become tan-colored fruits. ‘Blue Pearl’ and ‘Stairway to Heaven’ seem to be the most commonly available cultivars. ‘Stairway to Heaven’ was introduced by the New England Wildflower Society and is distinguished by its green and white to cream variegated foliage. While temperatures stay cool, the leaf edges are pale pink; then, when temperatures stay consistently warm, the variegation may disappear. Over the years, I have tried to grow most of the species and cultivars on the market. All have died with the exception of the Brent Horvath (Intrinsic Nursery) hybrid ‘Heaven Scent’ that I grow in full sun with average moisture. It has bloomed as early as mid-May for me, continuing into June, and frequently reblooms in September. As temperatures drop in the fall, the ferny foliage, that has a slight purple cast, becomes much more purple. Sadly, no one locally is growing it but it is available from Creek Hill Nursery or Intrinsic. Blooming in late April, Jacob’s ladder is a great plant for massing in the spring woodland garden. Use the ferny foliage as a foil for other types of foliage. Jacob’s Ladder is a nice complement to neighboring plants such as Arisaema triphyllum (Jack-in-the-Pulpit), Sanguinaria canadensis (Bloodroot), Trillium, and Geranium maculatum. 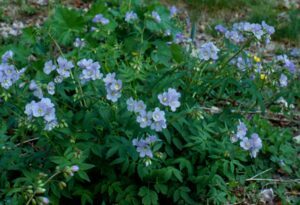 If you are planting in full sun, you might plant the Polemonium in front of a Pinus mugo with some Euphorbia on one side and Calamintha ‘White Cloud’ on the other. Either way, give it a try.